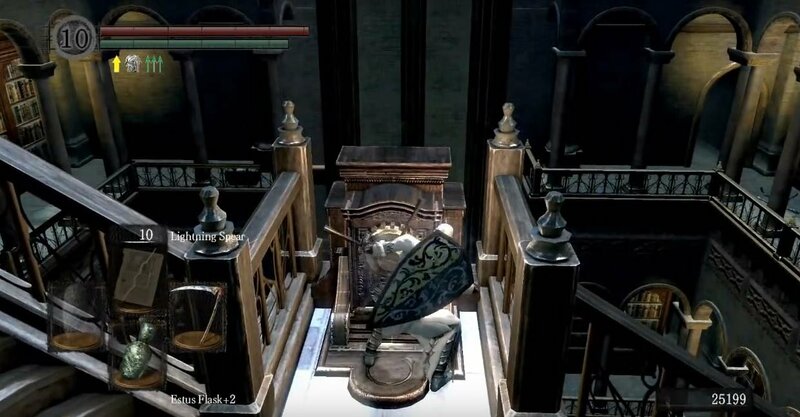 The Duke's Archives is a location in Dark Souls and Dark Souls Remastered. 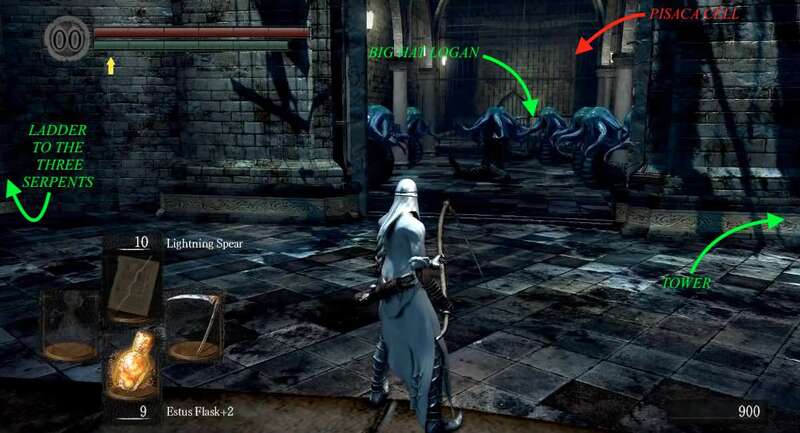 This area is only reachable from Anor Londo after placing the Lordvessel. 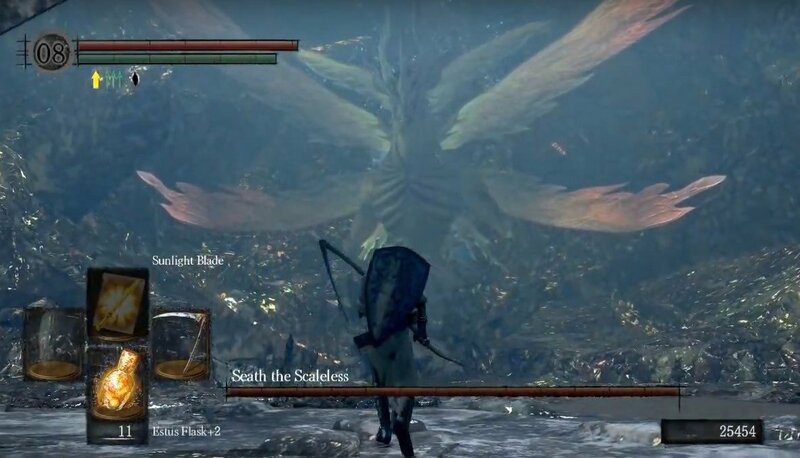 It's named after its boss, Seath the Scaleless, who was awarded a Duke-dom by Lord Gwyn for the role he played in the war against the Dragons. 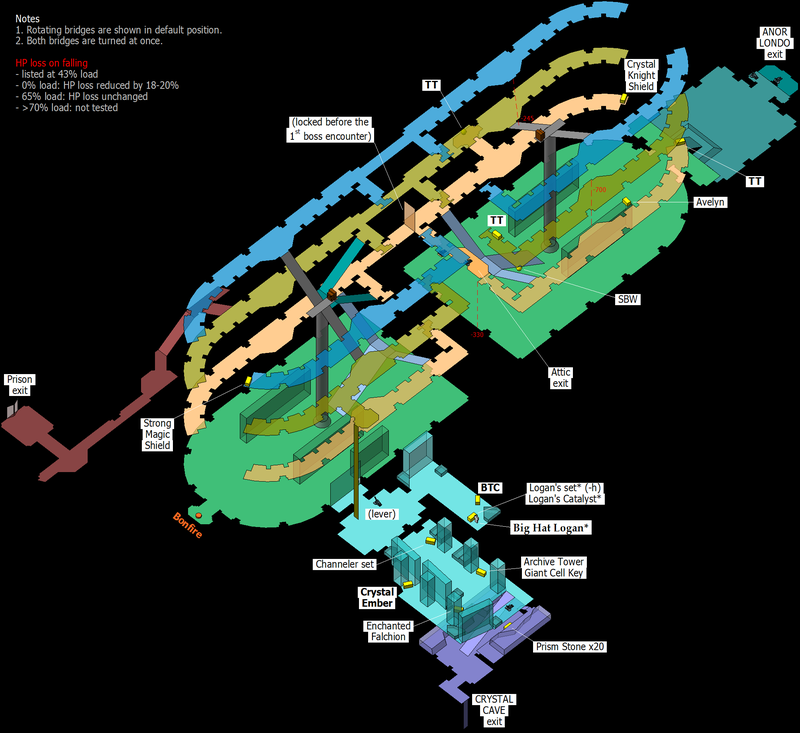 The area comprises a giant library, a prison tower and a small garden area that leads to the Crystal Cave. If you are playing as a mage or are heavily reliant on attacks that inflict magic damage (and not any other type of damage), be aware that beyond this point the area is mostly populated by crystal enemies who are highly resistant to magic damage. It's advised that such players learn to use pyromancy or get a fire or lightning weapon before proceeding, otherwise you will have a very difficult time disposing of the enemies in this area (unless you have very high intelligence). Also, obtain a Ring of Sacrifice as it will prove quite useful. From The Londo - This location is only accessible after obtaining the Lordvessel and placing it on the Firelink Alter. Once you do this, the Golden Fog Gate blocking the entrance will dissipate. To reach where this golden fog gate was, warp to the 'Anor Londo' bonfire, turn left out the door and head toward the building ahead. Head past the Sentinels in here and up the stairs on the right of the building toward the tunnel - this is where the golden fog gate used to be. Bay Of Pigs - In this tunnel you'll be greeted by an old friend; the Fang Boar. It's a lot stronger this time around, so be careful. Also be warned that if you continue through the tunnel you will meet a second one - so try not to aggravate both of them simultaneously, if you can help it. One way to tackle both is to aggro them and return to where the golden fog gate was - the boars can't cross this thresh hold, so by using a long reach weapon you are able to take them out with ease. Another way to deal with them is to try staying close to their side with your shield up and only attack once it has finished it's attack. Alternatively, they can also be killed fairly safely with poison arrows. If you didn't get a Fang Boar Helm from the Boar in Undead Parish, then this is your last chance to find one, because once they're dead they don't respawn and there's no more of them in the game - you'll have to wait til New Game + before you get the opportunity to get one again. Past them, at the end of the tunnel, find a large room with a bonfire and the elevator allowing you to enter the Archives proper. Pull the lever in the middle of the elevator to activate it. First Encounters Of The Crystal Kind - Once it reaches the top you'll run into your first few Undead Crystal Soldier, both ranged and melee. The ranged ones are Undead Crystal Archers and they generally stay put, waiting to fire on you when you come out of cover. The melee-based Soldiers on the other-hand will chase you down ,and if they're attacks connect, you'll find that they can deal decent damage - but are quite slow and susceptible to backstabs. Try to draw them one at a time where possible and fight the Soldiers behind cover so you don't have to worry about the Archers, and then take them out once all the Soldiers are dealt with. Artorias of the Abyss (Expansion) There will be a Crystal Golem standing to the right of the doorway here. If rescued Dusk of Oolacile, it will drop the Broken Pendant to access DLC areas through Darkroot Basin. Shhh... - The next room is just one of the two rooms in the Archive's giant library, and gives a glimpse as to just how large the Archives are. It's very tall room that goes up three floors with landings on either side. The room has two tall bookcases on either side as well, as you walk in that are useful for cover from the Crystal Soldiers, Crystal Archers and a Channeler as well. As most Crystal Soldiers may be buffed by the Channeler - at which point they're capable of dealing huge damage - engaging them behind the bookshelves, away from the attacks of the Channeler, is key in making it through this alive. Engage the one on the left first, which pulls the other one from the opposite bookshelf. Once you've dealt with those two, head in and charge the Channeler. When engaging him, it is very important to kill him quickly, as not doing so results in him teleporting away - he becomes invincible while going through his teleport animation; however, he is very susceptible to melee attacks. Head upstairs, killing the 4 Crystal Archers along the way. Look under the imperial staircase for a Crystal Soldier guarding a Soul of a Brave Warrior then proceed up to stairs you are currently under, and head left. At the end of this balcony, you'll find a chest holding Twinkling Titanite. Head back and up the opposite flight of stairs and continue to the end of the balcony. 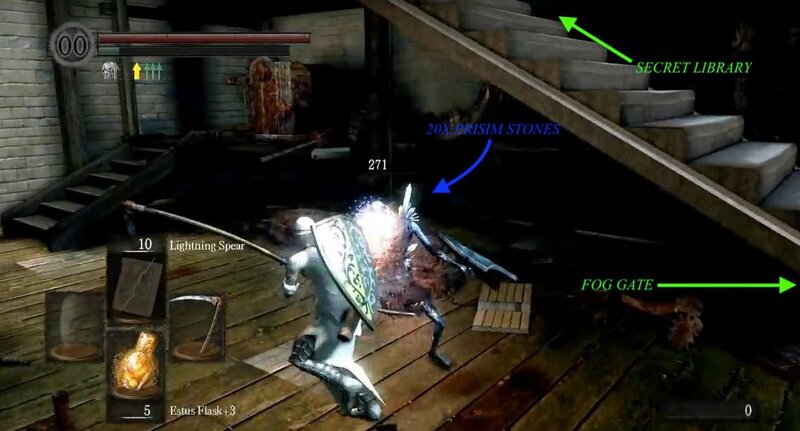 Along your way, you may notice a doorway on your left leading to a small outdoor balcony with a corpse holding an item (Twinkling Titanite), guarded by 2 Crystal Soldiers. Continue down the indoor balcony, to find another 2 Crystal Soldiers guarding a Mimic; kill it for a Crystal Knight Shield. Up Again - At the other end of the balcony, you'll find a lever-activated elevator. Take this lift up and continue through the only doorway available, and you'll run into a Crystal Knight, equipped with the Crystalline Set and a Crystal Greatsword; he's not too hard to deal with. If you're quick, you should also notice a Crystal Lizard in the tunnel - kill it quick to obtain two Twinkling Titanite and a Colored Titanite Chunk. Once they're dealt with, head up the crystalized stairs to arrive at a fog gate. NOTE: LESS OF A SUGGESTION, MORE OF A REQUIREMENT TO EQUIP A RING OF SACRIFICE BEFORE TRAVERSING THE FOG. Unjust Death Sentence - The fog gate leads to a boss - Seath the Scaleless. This is less of a boss fight, and more of a boss encounter as you cannot get within melee distance of him, and any health you manage to take will be replenished at an alarming rate. You have no chance, YOU WILL DIE. If you didn't equip a Ring of Sacrifice, as suggested, you'll lose your souls and humanity - you'll be lucky to make it back here without dying to retrieve it all again - you may also find yourself cursed when you respawn, depending on the attack Seath used to finish you off. Just to make it crystal clear, Seath the Scaleless must kill you here, in order to progress in the main quest-line. NOTE: If you forgot to equip a Ring of Sacrifice and change your mind, you may retract from the battle, through the fog gate you entered from, delaying your inevitable demise. NOTE: If you're mad that your zero deaths campaign has all of a sudden been ruined by something you have no control over, don't worry, the opportunity to enact your revenge on Seath the Scaleless will come later in the Crystal Cave. Once you do, you can head back to the room where you confronted him for the first time. Doing so will allow you to find the Large Magic Ember in a chest and some stairs leading to a Soul of a Great Hero. This is also the room where you will face-off against Big Hat Logan once he goes hollow, allowing you to collect some of his gear (See here or keep reading for more details on the final parts of Logan's quest-line) - so it's worth remembering to come back here, but only do so once Seath is dead. If you come back here before you kill him then you'll face the same fate as above again. Archiveshank Redemption - After your rather unjust demise, you will respawn you at a bonfire you've never been at. Not only that, you also cannot warp from this bonfire - so you're stuck here for the moment. It turns out that you've been locked in a prison cell along with some Crystal Soldiers, around the corner at other end of the cell. There's a locked door next to the bonfire and also another one next to the Crystal Soldiers that leads to a drop, but we'll come back to that one once we find the key to open it. There's a sleeping Serpent Soldier guarding the cell door by the bonfire, killing him will grant you the Archive Tower Cell Key, your ticket out of this cell. 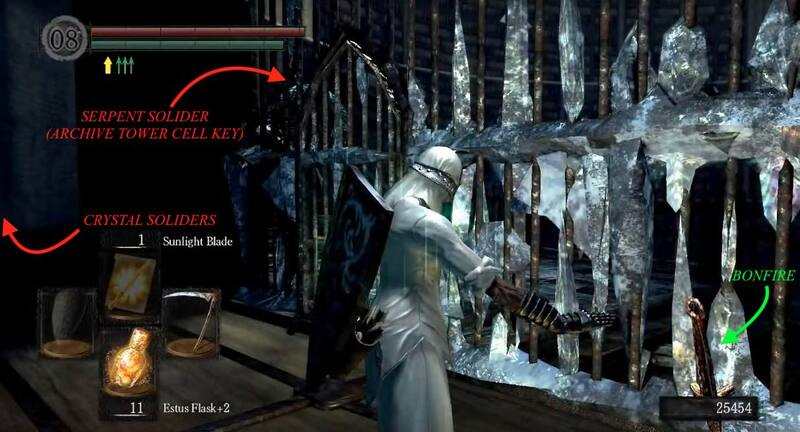 Alarming - Exiting the cell will trigger a cinematic, showing a Serpent Soldier pulling a lever to ring a shrill alarm that sends the monsters in the cell at the base of the tower after you. These are Pisacas - blue snake-like enemies with octopus heads that can prove a challenge in numbers - and they're now coming for you. Outside the cell you'll be near the top of a spiral staircase that lines the inside of the tower. You'll see two Serpent Soldiers on your left who will run to the ladder at the top of the stairs, fleeing the Pisacas and completely disregarding you. TIP: Make your life easier and die; as you're right beside a bonfire anyway, and alarm will have stopped and the Pisacas will be herded into their cell again, even after you respawn. This allows you to get on with your business without having to worry about them. So, get the Crystal Soldiers in your cell to do you a favor (equip a Ring of Sacrifice if you are Human and want to stay that way). Another option is to equip the Ring of Fog before you exit the cell. This will cause most of the Pisacas to not notice you, so they will only come up the stairs one or two at a time, becoming much more manageable (requires further testing). New Doors - Now that you're alive and well, work your way down the stairs and open any of the cells that you can (some may be locked) and search the cells to their entirety - some of them hold Crystal Soldiers inside, so beware. One of them will have the Archive Prison Extra Key in it. With the key acquired, run up the stairs and climb the ladder. When you get to the top, ignore the door for now and walk left. Drop down on to a ledge and into another cell to find the Maiden Armor set and the White Seance Ring inside. You can drop down in here again to land next to your bonfire. Go back up the stairs and use that key on the one locked cell door you passed on the way down to find a Large Soul of the Brave Warrior and a Crystal Soldier. Three Snakes With One Stone - Head back to your cell and proceed to the other end of it (where the Crystal Soldiers were), and open the locked door with the Archive Prison Extra Key. Drop down from the right side of the ledge to find a Soul of the Brave Warrior on a ledge below, and if you then drop down again you will be above a balcony with 2 Serpent Soldiers and a Serpent Mage at the back of the room guarding a chest, as well as the switch to activate/deactivate the alarm. Once you land, the best tactic to employ is to garner their attention and take the fight downstairs, via the ladder on the right (facing the lever). 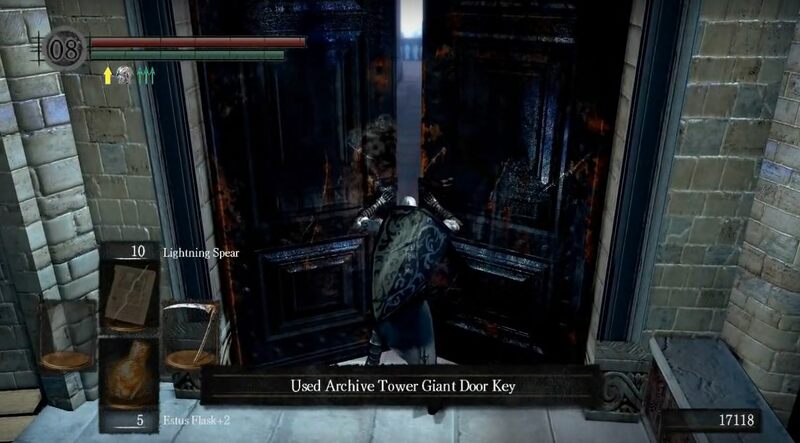 When all three Serpents are taken care of, retrieve the Archive Tower Giant Door Key from the chest to open the big door at the top of the tower. Back To The Archives - Down the ladder again, head right to find the Pisaca's cell full of Pisacas - if you didn't kill them already. Kill them all - Pyromancy is very effective - the two at the back by the pillar won't attack you but will drop Miracle: Soothing Sunlight and Miracle: Bountiful Sunlight, once you kill them. Behind the bars at the back of cell, you will find Big Hat Logan as well as an item at the far corner of the room, which requires a key. Once you're ready, make your way back up the tower again, ensuring you explore any cells you may have missed on the way back up, and climb the ladder at the top. You can now open the big doors at the top with your new key to go return to the Archives. Freedom-ish - Through the door at the top of the tower, there is a Crystal Soldier to your immediate right and a Crystal Archer to your far left. 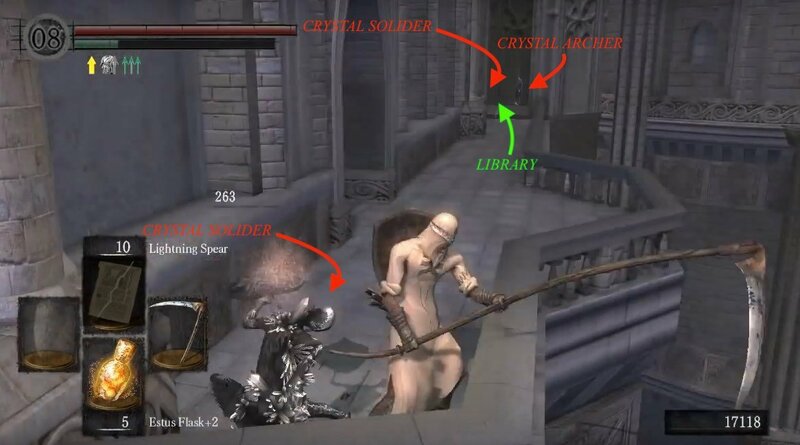 Quickly kill the Soldier then proceed towards the Crystal Archer, making note of the Crystal Soldier hiding next to him. TIP: A decent magic resistant shield is quite helpful in the next section. 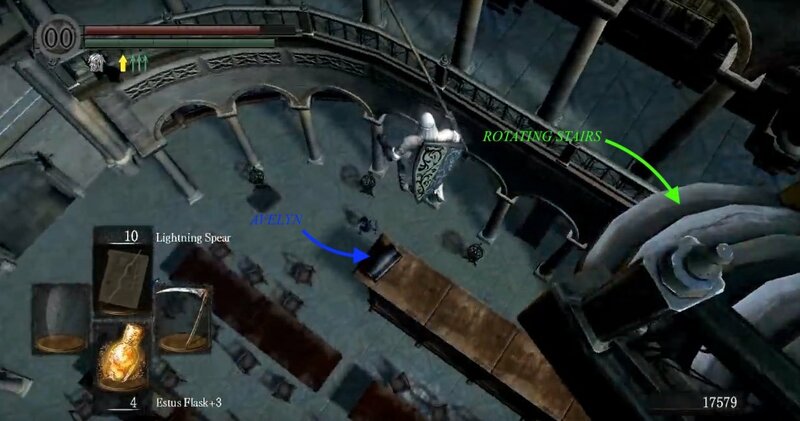 Crystal Enemies - Head up the stairs until you reach the balcony, leading you back inside to the Library. 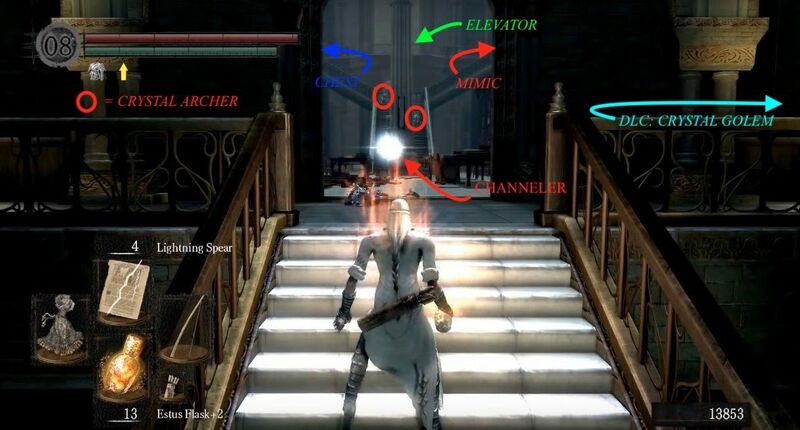 When you reach about halfway up the final stairs, a Channeler on the landing opposite and above you will start blasting you with Soul Arrows at you. If you have a decent bow, you should be able to take him out before entering, employing clever use of cover. Otherwise, you will just have to live with the inconvenience for a while longer and use the columns as cover while you deal with the other problems ahead. Enter the room, and on your immediate left there will be another Channeler, this one's on your level and within reach. The right leads to a dead end. Head left, past where the Channeler was, to find aCrystal Archer in the distance. 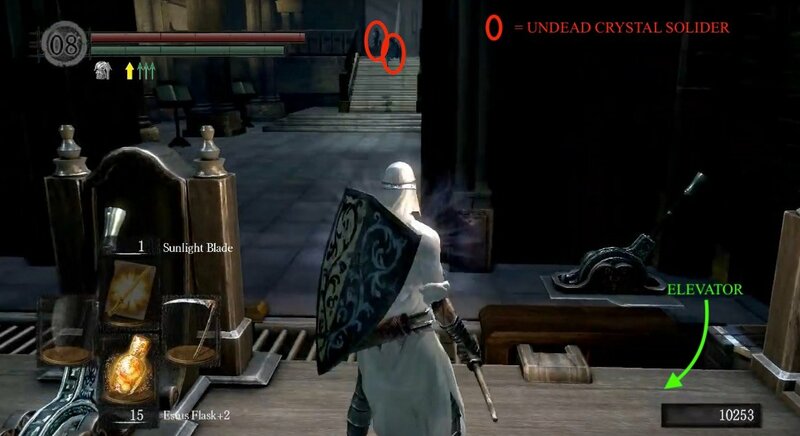 Once through the passage, there is another Crystal Soldier hiding on the right. Best strategy here is to charge theArcher then after, deal with the Soldier that will come running after you. Spinning Stairs - There are some stairs that go up a floor and leave you over on the landing on the other side of the room. About halfway up the stairs an Archer, behind you, will start firing at you from the landing above. If you are a mage or have a good bow, you can deal with him now. Head all the way up. On your immediate left there will be a Soldier and to your far right, another Archer - take care of them now while you're here. Head back to the stairs and you may notice a lever half way down it that will make the stairs turn 180 degrees. Turn this lever and rotate the stairway. Head down the stairs and take a right to find a chest containing Twinkling Titanite. Head back up the stairs and you'll be able to dispose of the Archer from earlier, if you have not already done so. To your left will be yet another Archer. Go through to the next room and you will see another Archer in the distance. Keep you shield up on your approach to him as he appears to use homing arrows - so simply sidestepping them does not always work. You may notice that the stairs have now rotated in this room as well. You can now drop down onto the stairs and kill the Channeler that was spamming you from earlier - if you didn't already take care of him, that is. Once up the stairs, head right to find a chest with Sorcery: Strong Magic Shield. Return to the stairs again to pull the lever and rotate it; head down and toward the doorway nearby doorway. To your right there will be a balcony leading out with an Archer waiting for you - a few ranged attacks should take him out, easily. There is a ladder on the right side of this balcony you can descend to find two doors that lead to the secret library and lever on the floor which opens up a passageway next to it. New Shortcut - We'll come back to the secret library doors in a moment, but for now go through the passage opened by the lever and you'll be back on the ground floor of the Archives again, but this time you'll find yourself in the second room of the library. In this room, there are two Crystal Soldiers hiding behind the bookcase and a Crystal Archer on top of it. Take a left once you enter the room and proceed to the balcony outside to find a bonfire. This room contains a shortcut on the 1st floor back to the initial room that you entered after the fateful elevator ride into the Archives. There is also a shortcut back to the Prison Tower from this room - go up the main stairs to the 2nd floor (not the rotating stairway) and you will find a quick return route to free Big Hat Logan after you find the key in the Secret Library . Hush Hush - Go back to area leading to the secret library and enter the door on the laft. In here you will find a chest with a Blue Titanite Chunk. 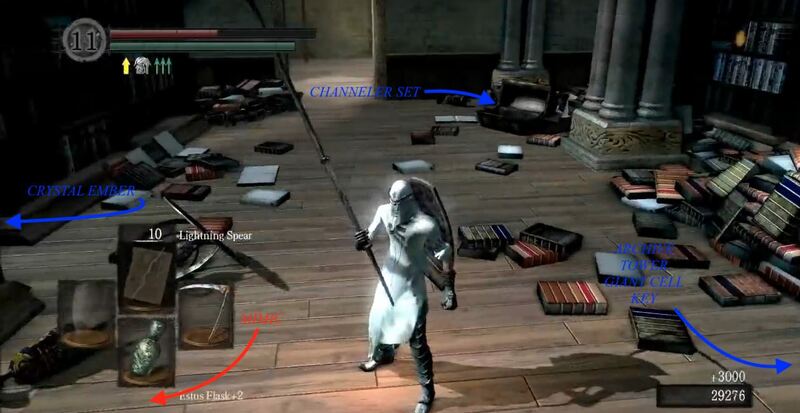 In the other room, there will be 4 more chests - two on your left, one on the right (beware, this one is a mimic) and another one hidden on the right between some bookcases. The Mimic drops an Enchanted Falchion and in the other chests you'll find the Archive Tower Giant Cell Key, the Crystal Ember and the Channelers Set. There is also a lever in the back left corner of this room that will reveal some stairs when you pull it. 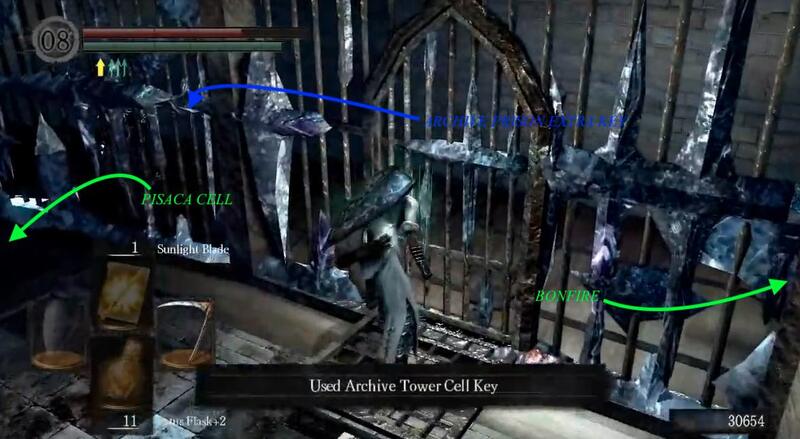 Note: Once you obtain the Archive Tower Giant Cell Key in the above section, you can go back down to the base of the Prison Tower to unlock the door at the back of the Pisacas Cell. Doing so will free Big Hat Logan again and let you obtain another Fire Keeper Soul. Once he's freed, you can find him back in the secret library; here he will sell a variety of new and greatly powerful, crystal spells. If you buy them all off him, the next time you talk to him he will not recognize you and will tell you to go away (you may need to quit-and-reload for this to happen). The next time you see him will be in Seath the Scaleless's original arena in The Duke's Archives, where a hollowed version of the man he used to be will become another enemy. Just remember to kill Seath in the Crystal Cave before attempting to find Logan for this fight. Into The Garden - Down the stairs in the secret library you'll find a Crystal Soldier and a chest containing 20x Prism Stones - which will prove their worth in the Crystal Cave. Traverse the fog gate to find yourself outside on a wooden platform that overlooks the Archive's Inner Garden - an open area with grass, trees and a large crystal structure dominating one side of the landscape. The area is filled with Crystal Golems that are much tougher than the ones you may have faced in Darkroot Basin, but there is a few items in here that are worth the fight. Towards middle of the area, find a corpse holding the Crystalline Set and then go back to the wooden platform. From here, turn so the wall is on your right side and then follow the wall around to sweep the area, take on the Crystal Golems and pick up the various Blue Titanite Chunks that are scattered around. 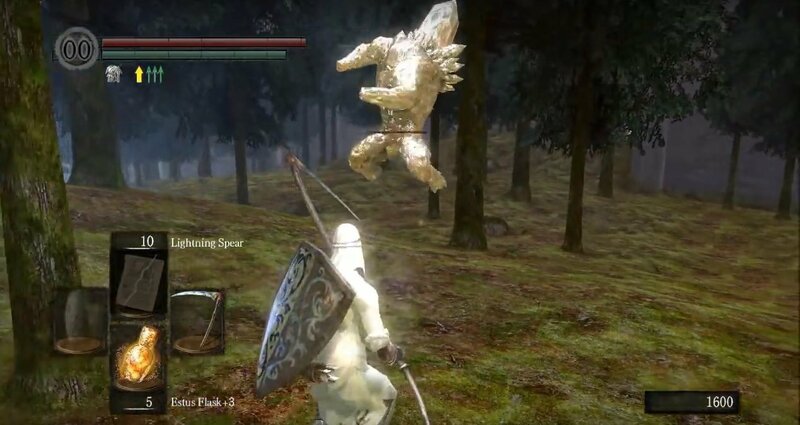 Note: If you have been correctly following Siegmeyer of Catarina's quest-line so far, you'll no doubt have encountered a Golden Crystal Golem in the center of the garden. If you faced off against the one in Darkroot Basin, you'll already be aware that they are quite dangerous - but if you didn't, then this is your warning. Upon defeating it you'll find Sieglinde of Catarina appears in the spot where it died. Talk to her to continue Siegmeyer of Catarina's quest-line - for more details in this regard, click here. Once your done in here, head toward the crystal structure mentioned earlier to enter the Crystal Cave. The Archive Tower is a very good place to farm for souls and Humanity. The strategy I found that works best is to start by turning off the alarm, then rest at the bonfire. Take out the Serpent Soldiers and the Crystal Soldiers on the way down the staircase. Once down you should take care of the Serpent Soldiers on the balcony (if you don't, they're likely to interfere when you kill the Pisacas). Once all you have left are Pisacas in the room is when the real fun begins. If you have them, I would advise equipping the Symbol of Avarice (Slightly raises soul absorption and item discovery. Random drop from mimics, so cross your fingers that you've found it. Be careful, your health will drain as you wear it) and the Covetous Gold Serpent Ring (Raises item discovery by a staggering 200). Now typically, the Pisacas won't leave their room, so my strategy was to take a running leap at a few of them, then run back out of the room (with 25 STR and Gravelord Sword +5 it was a 1-hit kill for any Pisacas in my way). Rinse and repeat as needed, just be sure to be careful as you kill them, because they will be massing, and your demise can come from your greed. Using this strategy with 2 humanity, the Covetous Gold Serpent Ring, and the Symbol of Avarice, I got about 8k souls per run (which only took a few minutes) and typically between 1-3 humanity from the Pisacas, sometimes as many as 4 or 5 though. NOTE: If you're a ranger I don't really have a strategy for you, sorry, but the principle is the same, and I'd imagine that for the Pisacas you could just hit them from outside of the room with no trouble as they rarely chased me out of the room. Magic strategy: When the pisacas are standing in their room they tend to line up in rows, which is convenient because Soul Spear passes through several targets without stopping. There's even a small splash-effect, or at least a cone of effect. With a decent Intelligence stat it's possible to kill 3-4 of them with a single, well-aimed shot -- my personal record is clearing the whole area with three shots, but the precision isn't really necessary -- by now you should have eight charges, and if not, mopping up the leftovers with lesser magic is very quick and easy. Pyromancy Strategy: Fireballs with an ascended pyromancy flame are more than enough for a one-shot kill, with the added benefit of drawing 0 aggro and often hitting two per shot. Giant fireballs and chaos fireballs may take out even more per strike, and are likely one hits with even un-ascended pyromancy. (Tip) If you want to farm without the danger of dying you can buy Dung pile's from the undead merchant (female) and just throw them at them, they will not agro and come out of the room, they will simply die where they are at. After 2-3 throws you should be able to toxify atleast 2-3 of them if they are a tad clumped up. Just remember to not give yourself the toxic status. (Tip) I found a great way to avoid battle if you want to JUST farm the Pisacas, you can close all the prison gates back up, except for the bonfire, and the Crystal Soldiers can't open them, on my play through I only had to kill the two Serpent Knights on the stairway, the ones on the balcony don't bother you if you just run down to the room with the Pisacas in it. The Duke's Archives inspired the subsequent areas: Brightstone Cove Tseldora (DS2) and Grand Archives (DS3). Well at first i tried to rush past those boar bois, but after that i couldn&apos;t use the first bonfire. It became available only after i killed them. The farming section at the end isn&apos;t advisable. The Darkroot Garden guardians are far safer, faster, and comparable in soul output (about 8600 per 1.5 minute run with Silver Serpent Ring, even more with the Symbol of Avarice). If you desperately need humanity, take a little time to start the DLC (it&apos;s short and you can definitely handle it at this stage of the game). In the Chasm of the Abyss area there are slow-moving humanity ghosts in big numbers, tightly packed, that you can kill with very little risk and farm tons of humanity (and twin humanity!) in a very short period of time. I can’t pull the lever to open the passage in the library, like no matter what I do, there is never a prompt to pull it. Help? I can&apos;t find this secret passage back to the beginning of the archives you speak of. Been searching for hours and nothing. So many goddamn books in this place. Seath&apos;s a huge nerd. You won&apos;t risk dying this way to get the avelyn. To get the avelyn from the chest on top of the bookshelf, rotate the stairs and run up to top then roll off of them onto the balcony below. Next just walk off the edge and ull land on the bookshelf. There is no crystal soldier in the locked cell with the soul. "There is also a shortcut back to the Prison Tower from this room - go up the main stairs to the 2nd floor (not the rotating stairway) and you will find a quick return route to free Big Hat Logan" so vague lol. If I skip the prison, could I still save Logan from prison? Or I will never get in to the prison?